"Hey, I know how I'm going to die. Yeah, it will be in a horrible car wreck. Mangled bodies, crumpled cars. If you can, try to find my phone to discover who I was texting or what my final email message was. 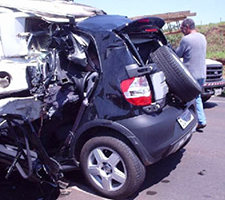 The phone may have been flung into traffic or grass near the road - you may have to search for it." That really would be a horrible way to die or to be critically injured. I have experienced drifting into another lane and looking up and having to correct the path of the car. Driving is complex and that, to be safe, a driver really does need to focus and pay attention to the single act of safely moving this huge machine among other huge machines, obstacles, and traffic control devices. It really is dangerous and I could easily do something about it. So I did. I have changed my driving lifestyle. Less texting and fewer phone calls; no emails and no web surfing. Exceptions: quickly checking a map to help me find the most efficient route while on road trips, and occasional phone calls, but I almost never answer the phone while in the car. And, if I really need to make a call, I pull into a parking lot or a side street. There just aren't many phone calls important enough to take my focus away from that big massive machine. Activities while driving, other than driving: Eating; Listening to music; Adjusting playlist and songs on radio, screen, or iPod; Drinking from a cup of coffee or a cup/bottle of water; Conversing with passengers; Adjusting windows, temperature, wipers, lights. Most of these repetitive activities we can do while we keep focus on the act of driving. 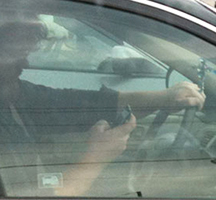 Texting, emails, and making a phone call, however, require one to focus longer on the device and not the road, traffic, or signals. One study stated that we can focus on driving and take our eyes off the road for about 1.5 seconds. Longer than that and we jeopardize the safety of ourselves and of others. 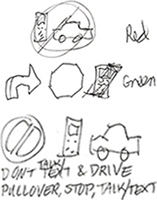 71% of young Americans say they have written a message while driving. 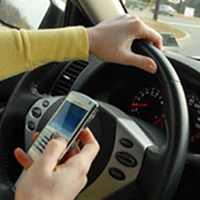 In 2012, over 3,000 Americans died in crashes related to distracted driving. I continue to see numerous people not only distracted from driving but also distracted from paying attention to red lights turning green. So, not only is there evidence that it is dangerous in terms or accidents and injuries, it is also detrimental in terms of disrupting the flow of traffic. It seems the requests to not text and drive are not working. Below are some other things we can do to save lives, reduce injuries, minimize car repairs, and improve traffic flow. 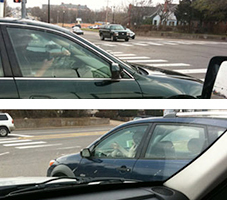 When you see a driver on the phone or texting, give 2 toots of the horn, short and quick - a code for the two words: Hang up. 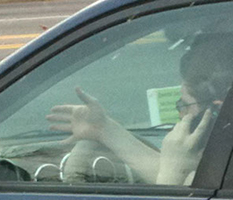 Just enough to startle the distracted driver. If enough people adopted this code, we might begin to change behavior. 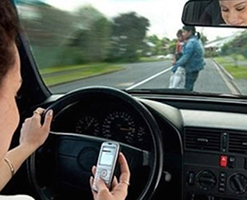 "Please don't text & drive" may be too sweet and polite. The message may need to be stepped up some. 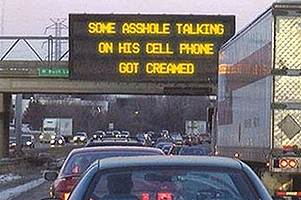 Don't text & drive is a bit too demanding and abrupt. It falls short of educating drivers what to do (Just say no was also a bit too abbreviated. Okay, after saying no, then what?). 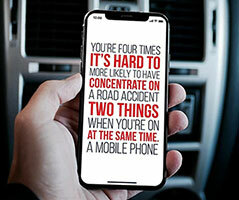 The media campaign to not text and drive doesn't offer an alternative, instructions on what one can do to minimize distracted driving. I saw a phrase, Call or text later. Nice and simple. 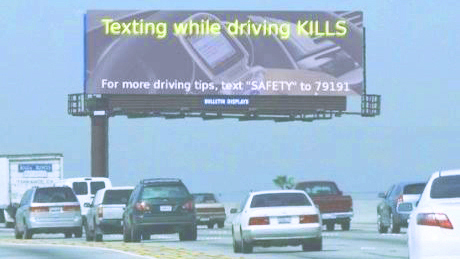 But, still not satisfactory for an important or timely message received while driving. 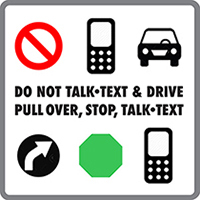 Pull over, Stop, and Talk/Text is a positive action that encourages the driver to accomplish a task. The only downside is the driver may arrive at a destination a few seconds later. The upside is more alert drivers: less sitting when the light turns green, less easing into another lane, less slamming into cars in front. • Helps educate the texter with better behavior. • Simple, clear, attention getting. • Pull Over - a green highway sign arrow. The driver will likely turn or ease over to the right. 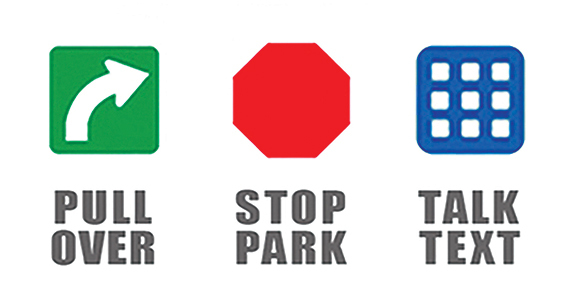 • Stop & park - a very familiar and recognizable red stop sign. 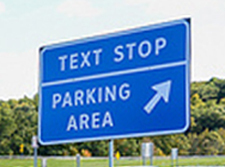 • Talk or Text - a phone in blue, the highway sign color for 'information'. • Instruction text in grey - readable yet not too distracting from the symbols. 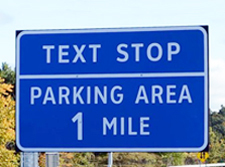 New York State has introduced 'Texting Zones' along its major highways and thruways - pullout stops where drivers can read, write, and send texts, phone calls, and emails. 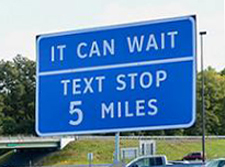 Governor Andrew Cuomo said 298 signs will be positioned along the state's busiest roads, pointing drivers to 91 Texting Zone locations. The zones will cost nothing to build as they already exist in the form of rest stops and parking areas. It's really all about the signage, branding the locations, and educating drivers. 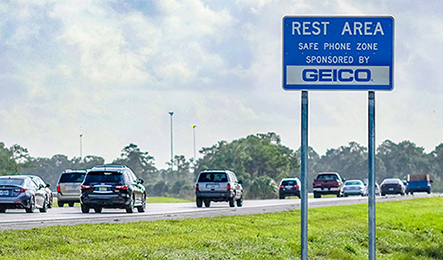 The state is rebranding the Rest Areas as Safe Phone Zones. 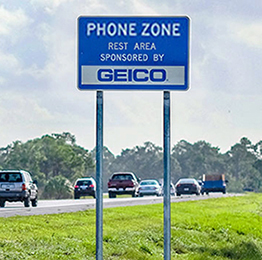 But, not obvious enough - the areas are still called Rest Areas with just a smaller line underneath for Safe Phone Zone. They could easily swap the two lines for a clearer brand of Phone Zone. More info. Hoping this is a joke. She texted that she was so happy and then she killed herself. At 8:34a, police were notified of a crash. In the moment she posted that message, the woman crossed over the median of Interstate 85 and collided with an oncoming recycling truck. Later that day, some of her friends and family told investigators about the Facebook post. 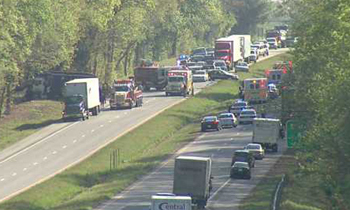 Investigators discovered the Facebook post was made seconds before the deadly crash. "In a matter of seconds, a life was over just so she could notify some friends that she was happy." Sanford's car went off the road and caught fire. The collision caused the truck to run off the road and hit a tree; that driver was not injured.